In many ways, our first friendly was a disaster: a 4-0 drubbing by a Dinamo team that’s probably the worst we’ll play this preseason. We struggled with their pace and had a miserable time shooting the ball. And I’m delighted with the result. In almost every category, our players held their own. We had 48% of the possession, completed a higher percentage of both passes and crosses, won more headers, and had the same number of shots on goal. The difference? Our forwards couldn’t get the ball on target (a legitimate concern) and our goalkeepers couldn’t stop any shots (also a concern, though slightly mitigated by the fact that I used the first half to try out a promising 16-year-old). Otherwise, we looked completely credible against a UEFA Cup team with 10 times our net worth. This is an encouraging sign, especially because I didn’t put in any tactics before the game. For my first look at the team, I wanted to see them in a system that wasn’t designed around their strengths and weaknesses, so we played a very neutral 4-4-2 and I made no adjustments during the game. There’s nothing like watching players do it on their own to tell you which ones you can count on. So while we struggled at the extreme ends of the pitch against a vastly superior side, we looked very strong everywhere in between, and without even running a scheme designed to help us. I think now would be a good time to introduce a few of the dressing-room characters I’ve got my eye on. He’s only 20 (which actually makes him older than a majority of the squad), but right now, Carlo Saba looks like the key to our season. It’s not just that he’s quick—and for our team, he’s very quick—or that he’s our only players to have double-digit skills in both dribbling and passing. Look at the mental side of his game. He’s determined, brave, hard-working, and a good team player. He’s a player the rest of the team respects. We’ll need him to set the tone on the pitch and also to run our attack. I’m concerned about his decision-making—his ability to read a game is clearly lagging behind his other attributes—but no one said you could have it all in Serie C2/A. Our captain when I joined the club was a 36-year-old corpse with a persecution complex whom I shipped out to the first ready buyer. I had very little choice but to replace him with Marco Palombi, our current starting goalkeeper, who seems to be a talismanic figure to the other players. As you can see from the wicked little Oktoberfest grin on his face, he’s delighted to be so honored. Given his advanced age and deteriorating reflexes, I’m taking a huge risk by playing him—I’m basically gambling that his effect on morale will make up for his questionable shot stopping—and I’ll be smiling like that if I don’t have to replace him in January. After the match, I drew up two quick tactical schemes, one attacking and one counterattacking, which I’ll refine over the next few weeks. For the moment, we’ll be playing in an unfussy 4-4-2. The weakness of our central midfield means we’ll need to push the ball up the flanks (I’m looking at you, Carlo Saba) and hope Conchione can punch in a lot of crosses. He’s a great jumper, which should help. He’s good in the air, mentally even stronger than Carlo Saba, and will mark a lot of Serie C players out of their boots. Plus he has the hair of a young Lionel Richie. Obviously a captain in the making. One Last Note. Shortly after the Dinamo game I glanced at our “affiliated clubs” list and noticed, to my surprise, that our parent club was Juventus. 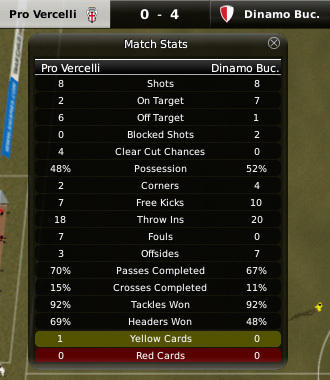 That’s not the Pro Vercelli I know. I canceled the link. My God. I guess that would explain his tendency to lead with his elbow. We probably shouldn’t be that surprised though. Bleaching your hair and abandoning everything and everyone you know just to scratch out a meagre sham of an existence at the foot of the alps for a duff Serie C2/A side is exactly the sort of crazy behaviour I would expect of someone cursed with such an ominous combination of decision making and determination skills. Luckily for him though, you have taken over. You know, his marking skill is a 1, so maybe he just wound up here while trying to defend Marlon King.